Our friends at Chimney Rock Park have planned out an excellent schedule of guided hikes and other events at the Park for 2009, starting this month. For our nature-loving guests, the Park has an “Off the Beaten Path” guided hike scheduled for January 24, called Winter Tree Puzzling, where a guide will teach you how to identify different tree types, and you get to enjoy the scenery of Hickory Nut Gorge at the same time. The February “Off the Beaten Path” guided hike will be February 14, and is titled Nook and Cranny Crawl. This hike gives you the opportunity to tour the boulder-strewn woods in the Park with a naturalist, learning about the different geology, flora and fauna in the area. Those of you who have put “exercise” on your list of New Year’s Resolutions and don’t mind bundling up a little for a beautiful hike can get your blood pumping on the Four Seasons Trail or the Outcroppings Trail at the Park. A network of stairs and boardwalks make up the Outcroppings, a half-mile roundtrip alternative to taking the elevator to the Chimney. 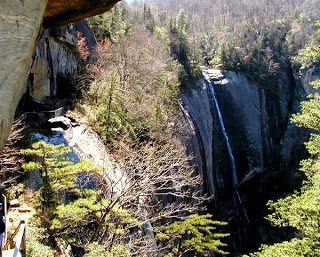 The Four Seasons Trail is a 1.2 roundtrip, moderate-to-strenous hike leading to the Hickory Nut Falls Trail and has a 400-foot elevation gain. If you continue on the Hickory Nut Falls Trail, you’ll reach the bottom of the 404-foot Hickory Nut Falls. Finally, calling all Groundhog Day enthusiasts: Chimney Rock Park’s mascot, Grady the Groundhog, will be the star of the Park on February 2. At 10am, all eyes will be on Grady as he makes his predictions for Spring…will he see his shadow? This entry was posted in Uncategorized and tagged hiking, outdoors, Winter by Inn on Mill Creek. Bookmark the permalink.